I was actually looking forward to this weekend. I had plans with family and friends (along with a little shindig on Woodward). Because of this, I had focused mainly on getting my work done and didn’t pay any attention to the radio for pretty much all of Friday. I politely told then what they could go and do with themselves. Pres. Trump caving on The Wall was antithetical to everything that he stood (and campaigned) for. After another one of my friends chimed in and said that he wasn’t making it up, I pulled out my phone and checked for myself. I made a few comments that are not exactly repeatable here, but since we don’t meet very often, I wanted to enjoy the rest of my evening. Some RM readers may remember a little-known movie back in ‘95 called “Braveheart”. There is a very poignant scene near the end involving a little bit of Scotland’s history, namely the Battle of Falkirk (1298) against Longshanks (aka Edward the First) and his forces. For those of you who may not be familiar with that scene, Scottish Forces under the command of William Wallace were successfully waging a guerilla war for Scotland’s independence against the English. Initially, the battle was going in Wallace’s favor. When the time came during the battle for the cavalrymen under the command of the Scottish nobility to engage Longshank‘s army, they instead removed themselves from the field and fled, while Wallace looked on in shocked disbelief at their betrayal. That would be a fairly accurate way to describe how I felt Friday Night/Saturday Morning. I didn’t go to the rally on Woodward (even though I had planned to), and instead re-arranged my schedule to take my nieces and nephews out to lunch instead. Spending a little more time with my family made me feel better, but it still the question remains: What now? So, I did some digging to see if I can find out exactly HOW this happened. I am pleased to report that House Republicans DIDN’T cave on this, despite what the media would like you to believe! Everyone from Michigan’s Republican Delegation voted AGAINST this disgraceful piece of legislation. Even Upton had enough common sense this time around to do what was right. From my reading on this last night/this morning, the weakest link in the chain can squarely be identified as Senate Majority Leader Mitch (Squish) McConnell (RINO-KY). Mitch? Oh, Mitch??? Where were you Mitch? I can rattle off several REAL Conservatives in the US Senate who would NEVER sign off on such a move like Cruz or Paul! This is clearly a parliamentary trick if there ever was one! Boy are these people in Kentucky gullible! I’ve even got the rest of America fooled as well. They think I’m really a Conservative. Sadly, instead of doing his job and making the case for The Wall (or avoiding this scenario altogether with a tactical nuclear strike), Mitch sat silently on his worthless posterior while the Chuck & Nancy Show was making the rounds. The media, in a TDS frenzy simply ate it up and gleefully oversaturated the airwaves with it. Meanwhile, the rest of Team “d” was getting nervous behind the scenes. How many people (not government employees or their families) were actually complaining about the effect of the shutdown to furloughed employees? Good luck finding those stories. It ruins the attack narrative that media has on our President. They were getting p.o.’d at the problems caused by the government NOT being able to fulfill the job it had given itself. Speaking of the problem I mentioned above. Team “d” was well aware of that Sword of Damocles swinging precariously over their head. President Reagan had faced a similar problem before. For those of you not familiar with that part of history: he simply fired them. Can you imaging the fallout to the Team “d” support base when (not if) that happened on a larger scale? And now, with the ball firmly in the democrat’s court, the problem at hand is this; what will the democrats do? If history is any guide (and it usually is), absolutely nothing! It’s no huge secret that the democrats are notorious liars when it comes to keeping their word in Capitol Hill. How many of you are old enough to remember TEFRA? This was the tax hike that the democrats conned Reagan into signing back in ‘82. Give us our tax hike. And in exchange will give you $3 for every $1 in new taxes. Anyone want to take a guess as to how much budget cutting the democrats did back then? Let’s give illegal aliens amnesty, those poor, suffering, just seeking a better life for themselves and their families illegal aliens JUST THIS ONE TIME, and we’ll never ever come back to you ever again on the subject. Do I really need to tell anyone here how well THAT went? I can easily provide many more examples than what I’ve posted above, but I’d like to quickly wrap this post up. Team “d” is obviously all full of themselves after the con they had successfully pulled on the American people (with the invaluable help of Sen. McConnell-RINO KY). In less than three weeks we’ll be at it again. Let’s see what happens then. Not entirely accurate about Upton, tho. Fred was one of ten House RINOs who voted for Pelosi's bill to reopen government. For that matter, Mitt Romney was one of six Senate RINOs who voted for Schumer's bill to reopen government. Do note that McConnell voted 'nay'. Mitch ain't the problem. Willard is. 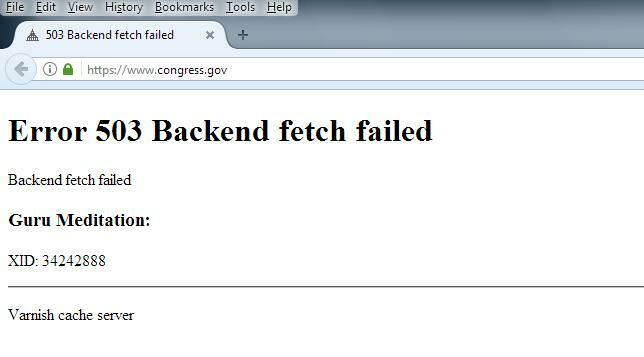 And, of course, their site is down this evening. From my read of the journals this morning, HJR 28 was the one that went to the President's Desk first, which prompted the shutdown to end. As for Willard...he might have the attention of those with far more seniority as nothing more than a boot-licking toadie,but even he doesn't have the necessary pull (yet) to pull parliamentary tricks. But last I checked, Pelosi has his job now. And I did cite him as the cause of there being no wall back in the 115th. Pelosi has the job now. M'kay, and why is that? Cuckservatism Inc., is alive and well in The Swamp. How many times would you want me to repeat the same facts, CS? Until your "facts" become inline with reality. Flinging poo at SML McConnell, only serves to marginalize President Trump. "Meanwhile, the rest of Team “d” was getting nervous behind the scenes. " Nonsense! #NeverTrump and, especially, the Democrats didn't care about the partial government shutdown- they placed it in motion. I don't have to "fling" anything at anyone. McConnell's actions speak clearly for themselves. Just one quick example off of the top of my head, I shouldn't have to tell you that the Super Bowl is next Sunday. If you thought that people weren't howling enough at the airport delays now, just wait until you see the fallout from that had the shutdown remained in effect. PATCO would've been simply a warm-up. The Super Bowl? Who honestly gives a flying one about the Take a Knee League and their Social Justice halftime extravaganza. Lolololzzzzz. Get serious. There's what reopening government for three weeks is all about- recharging EBT cards. Did you hear one orc, just one, blame the Democrats for the shutdown, which as Sen. Cruz pointed out in video above, the Democrats created? No. They blame President Trump, who wisely chose not to have an orc uprising to deal with at this time. And I haven't seen this already in either Detroit or Chicago already? The weather will easily put the protestors in check for some time. They don't like going out in the cold. Millionaire ingrates aside, do you know how many people travel to an event like that? RM readers, I do believe we've found who uses Gillette round 'chere.